There was never any doubt Virgin Australia would incur a FY2014 loss in its domestic operation as a result of over-capacity. And indeed Virgin had a domestic AUD59.2 million EBIT loss, larger than FY2013's AUD34.6 million loss. But more unwelcome was a large swing at its international operation, which posted a FY2014 EBIT loss of AUD66.8 million, significantly worse than FY2013's AUD8.5 million loss. International's margin of negative 5.8% was also significantly worse than domestic's negative 1.9%. International was impacted by substantial competition to Southeast Asia, an overall small market for Virgin but with disproportionate losses. More subdued domestic market conditions should improve Virgin's performance at home, but international offers no such comfort, raising the question of whether Virgin needs to leverage its LCC unit Tigerair Australia to take over leisure routes no longer suited to Virgin's full-service proposition and cost base. Virgin's overall FY2014 underlying loss of AUD211.7 million was in line with market expectations and accompanied by news Virgin is selling a 35% stake in its loyalty programme, valuing it at AUD960 million, a significant part of Virgin's total market capitalisation of AUD1.4 billion. Virgin is looking to accelerate growth in this division whereas Qantas has decided to retain total control and the annual revenues. Citing one of the most dififcult operating environments in Australian aviatrion history (an increasingly familiar refrain), Virgin widened its group loss. Virgin's domestic margin slightly worsened from negative 1.1% to negative 1.9% while international's margin performed worse, with the margin falling to negative 5.8% from negative 0.7%. Total liabilities: AUD3631 million (USD3332 million). The market has been concerned about Virgin's CASK growing faster than RASK, which continued in FY2014, although CASK growth including fuel and foreign exchanged was halved to approximately 4%. CEO John Borghetti said Virgin needed to be fiscally responsible without impacting its proposition and customer experience. “This is not about slashing and burning the company,” Mr Borghetti said in a reference understood to be directed at Qantas' latest restructuring. 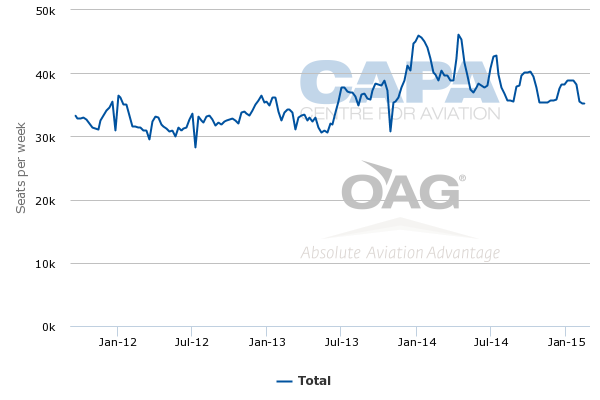 Tigerair Australia, in which Virgin has owned 60% for most of FY2014, continues to be a loss maker for Virgin. 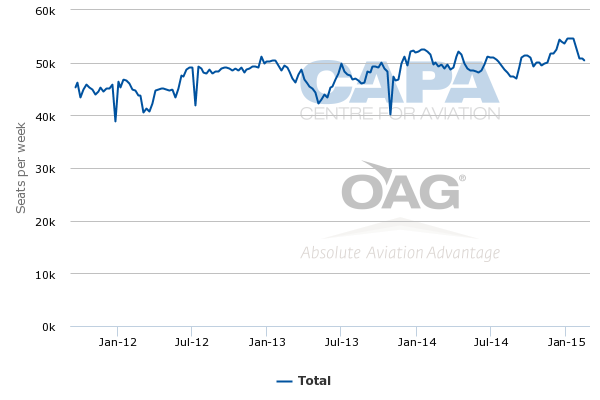 Tigerair Australia's equity-accounted loss in FY2014 was AUD46.1 million (USD42 million). Tigerair's loss was half that of Virgin's domestic loss despite Tigerair being significantly smaller than Virgin. Virgin remains optimistic and expects Tigerair Australia to be profitable by FY2017, implying continuing losses as it beds in. Virgin did not disclose any guidance for its own mainline performance. Virgin Australia announced plans to establish a freight division during FY2015. The freight business is to leverage Virgin Australia’s existing RPT and charter capacity to deliver revenues of between AUD150 million (USD140.2 million) and AUD200 million (USD187 million) by 30-Jun-2017. Virgin's "Game Change" strategy targeted increased corporate and government revenue, and Virgin has exceeded its 20% target by having 25% of revenue come from this segment. Virgin's new "Virgin Vision 2017" strategy is targeting a 30% share, representing slower growth but approaching Virgin's natural share of this premium market given Virgin's capacity share of the wider domestic market. 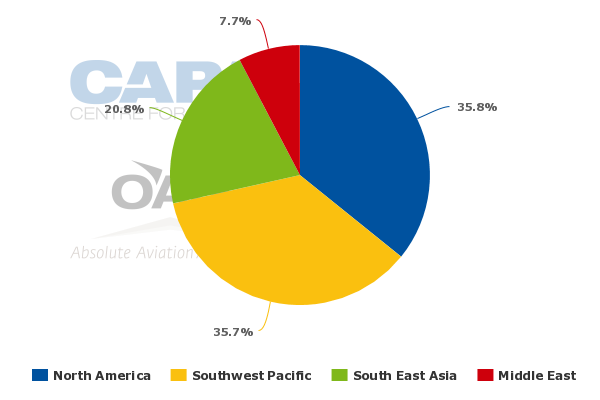 Virgin Australia is primarily a domestic carrier with 61% of scheduled mainline ASKs in the domestic market. 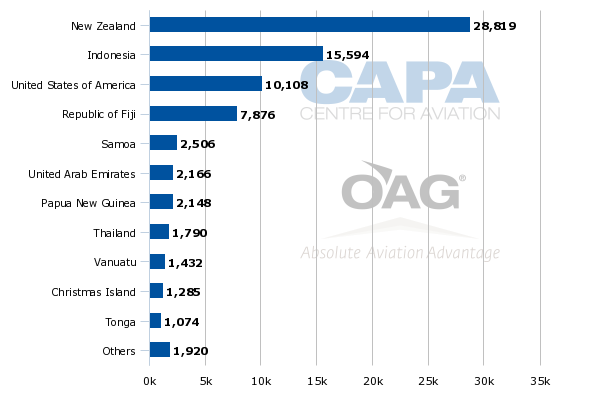 Of international capacity, only 21% of ASKs reach Southeast Asia, according to OAG. 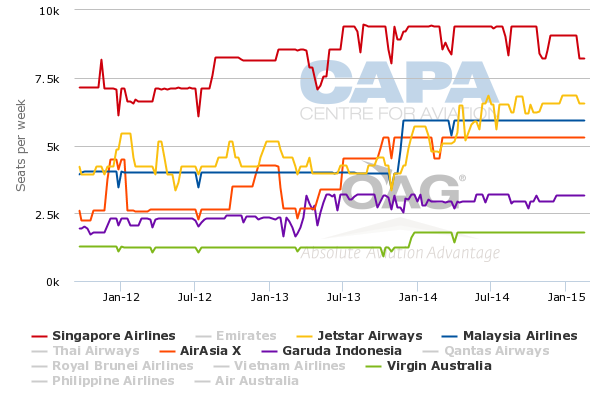 Virgin Australia does not break out performance for specific international markets. Virgin Australia attributed its larger international loss to Southeast Asia, which has seen a rapid influx of leisure capacity. Virgin serves just two points – Bali Denpasar and Phuket – but these are very much the focus of increased capacity. Virgin serves Phuket from only Perth with five weekly flights. Virgin is much larger to Bali with service mainly from Brisbane, Melbourne, Perth and Sydney. Virgin has more seats to Bali than to the United States while New Zealand has twice as many. Bali is Virgin's only destination in Indonesia. 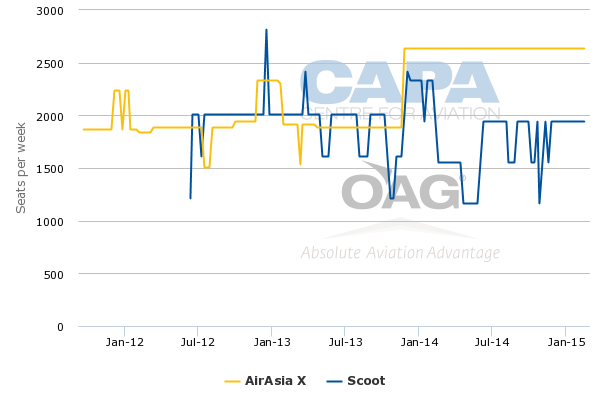 Bali and Phuket have been impacted by an increase in capacity from Asian carriers, notably low-cost carriers that have a lower cost base through their Asian geography but also (in the case of AirAsia X and Scoot) through widebody usage, lowering unit costs. At the same time, Virgin's cost base has increased. AirAsia X and Scoot operate widebodies near their certified maximum while Virgin has a medium density on its narrowbodies, which can be further hampered by having to block seats in order to fly non-stop. Bali and Phuket are some of the top connecting markets for AirAsia X and Scoot. Full-service carriers are also a factor as they know they can sell cheap tickets to these popular leisure points. Ex-Australia yields, even to leisure points, are usually higher than ex-Asia yields. Although Virgin has a non-stop proposition (but also sees some connecting traffic), the leisure nature of the market translates to price sensitivity, and the market is willing to have a stop or even, in the case of Bali, to backtrack through Kuala Lumpur and Singapore. AirAsia X and Scoot also sell a wider range of Asian destinations (including stopovers in their home hubs), giving the Australian market an opportunity to see other parts of Asia in addition to their beach holiday. 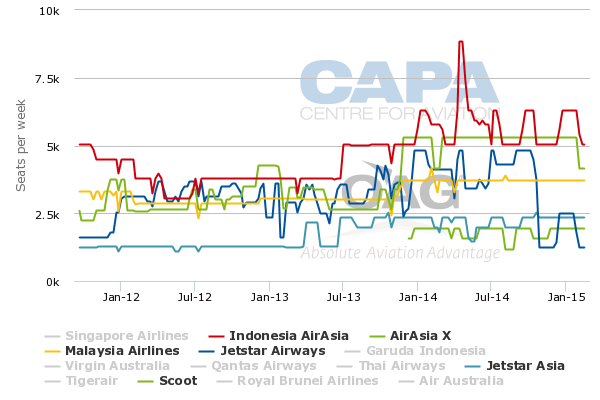 In Perth, Indonesia AirAsia and AirAsia X have substantially increased their capacity while Jetstar Airways, Jetstar Asia and Malaysia Airlines have grown as well. Scoot has entered. 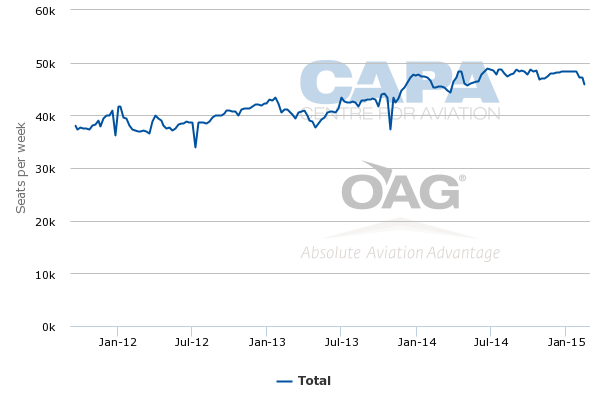 A portion of this capacity is offset by decreases at other airlines (for example Qantas). But overall the market has grown, with much change since the start of 2014. Melbourne-Southeast Asia has seen growth from AirAsia X and Jetstar, but also full-service carriers like SIA and Garuda. The market has also seen absolute growth, of almost 20%. 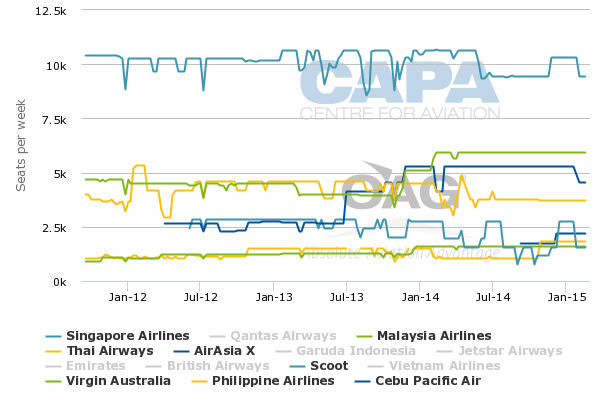 Sydney has not seen a drastic increase in total Southeast Asian capacity, but this appearance is the result of Qantas and British Airways decreasing traffic that was either focused on Europe or the Asian full-service market. Airlines like AirAsia X, Scoot, Malaysia Airlines and Philippine Airlines have increased capacity (or, in the case of Scoot, entered) with a much more aggressive focus on the leisure segment than BA or Qantas had. 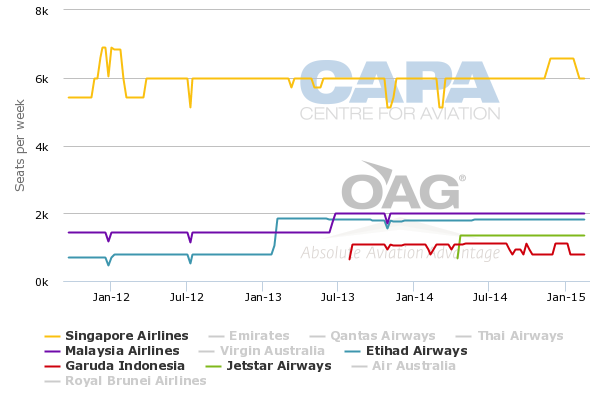 Brisbane and the Gold Coast have seen more moderate increases in Southeast Asian seat capacity. There are limited signs of growing SE Asia-Australia capacity discipline as Scoot links its Gold Coast and Sydney markets. Post-restructuring, MAS may cut its Australian capacity. But Virgin will likely experience more pressure, directly and indirectly. Bali-based Indonesia AirAsia X is due to launch Bali-Australia flights while other Indonesian carriers may look to serve Australia as well. Capacity from carriers like Cebu Pacific and Chinese carriers will push local and North Asian connections. That may see Southeast Asian carriers focus on Southeast Asian connecting destinations, further pressuring Virgin. It is difficult to see Virgin maintaining its Southeast Asian network as is. It is small but with disproportionate impacts. Virgin now has the opportunity to deploy Tigerair on these leisure routes. Its lower cost base is more appropriate but Virgin so far seems inclined to restrict Tigerair to the domestic market. Tigerair had previously been legally confined to the domestic market as Australian airlines can fly internationally only with majority Australian ownership; Tigerair was 100% foreign owned until Virgin took a 60% stake. However, Tigerair is going through its own changes. A shift from domestic to international is premature while the foundation is being bedded down and the brand is revitalised. Virgin Australia announced it is selling a 35% stake in its loyalty programme, Velocity, to investment firm Affinity. The purchase values the programme at AUD960 million – a significant sum considering Virgin Australia has a market capitalisation of AUD1.4 billion. Velocity will remain part of the Virgin Australia Group but with a separate board and management team. Virgin will appoint the chairman and have 65% of voting rights. Virgin expects the transaction to be completed by Oct-2014 and will gain AUD336 million excluding transaction costs. Virgin's decision to sell a stake in Velocity contrasts to Qantas' announcement on 28-Aug-2014 that its review of its loyalty programme concluded with the decision not to sell as Qantas can still create value. However, Virgin Australia CEO John Borghetti said he viewed the Qantas programme as mature while seeing Velocity younger and capable of faster growth - it has certainly grown remarkably rapidly since its introduction only three years ago, creating a billion dollars of value from a standing start. Faster growth could enable Velocity to catch up with Qantas' programme. However, it is not clear private equity is needed to accelerate growth: loyalty divisions have small teams and large margins. A specialist loyalty group like Affinity may have the wherewithal. Virgin expects the sale to reduce its sheet gearing by 8% with the transaction to be neutral in FY2015 results. Virgin announced it will roll out business class on Trans-Tasman and Fiji services from Feb-2015. Virgin's product across the Tasman has been misaligned to partner Air New Zealand, with Air NZ able to offer a premium proposition by blocking the middle seat. But now Virgin will leap ahead of Air NZ with a dedicated business class. As for Fiji, Virgin may feel it needs to launch the product before a revitalised Fiji Airways secures the premium demand. Virgin separately told Australian Business Traveller that in Sep-2014 it will unveil a new business class seat for its widebody A330 and 777 aircraft, likely to make the product more competitive with Qantas' new A330 seat that allows direct aisle access. Virgin's 777 premium product was not the most luxurious when unveiled and with time has looked more dated, especially in comparison to strategic partners Delta and Etihad. Retrofits and newer seats do not come cheaply, however, and Virgin appears to be engaging in what Mr Borghetti once detested as a "nuclear arms race" of product improvement. Virgin each time looked to be thrifty and gradually improve on Qantas' product without being revolutionary. Qantas responded with larger improvements, and now Virgin, as the poor man, pays twice. It is unknown if Virgin will seek scale in the product division from the purchasing contracts of partners, notably Etihad, which is keen to promote synergies. Virgin Australia for a few reporting periods has discussed it is considering its future long-haul fleet, but its focus is on the domestic fleet. Virgin has mooted a range of widebody aircraft for the future, but when asked for an update Mr Borghetti remarked: "We don't have to rush into this. What we have to rush is the narrowboyd fleet –and bring forward as much as we can." Mr Borghetti said Virgin could potentially tap into the order book of Etihad, as some of Etihad's other equity partners have done, but Mr Borghetti also said Virgin could look to work with its other equity owners, Air NZ and Singapore Airlines. In the short-term, Virgin will retire its two oldest A330s. These aircraft have had low reliability and a sub-standard product. They will be replaced by one new A330, leading to a net reduction of one A330. Further A330s deliveries in the future are a possibility. Virgin says it will continue to grow its ATR fleet to 13 aircraft, but Virgin also says it operated 13 ATRs as of 30-Jun-2014. Virgin also intends to increase E190 utilisation. Qantas is looking to increase fleet-wide utilisation. Virgin is accelerating 737 MAX deliveries (it has 32 on order) with the first to arrive in 2018, one year earlier. This will give Virgin efficiency improvements. Qantas has not yet ordered next-generation narrowbody aircraft for its mainline division, but once it does Qantas will also gain efficiency improvements. Virgin's average fleet age (excluding Virgin Australia Regional, the former Skywest) is approximately five years. 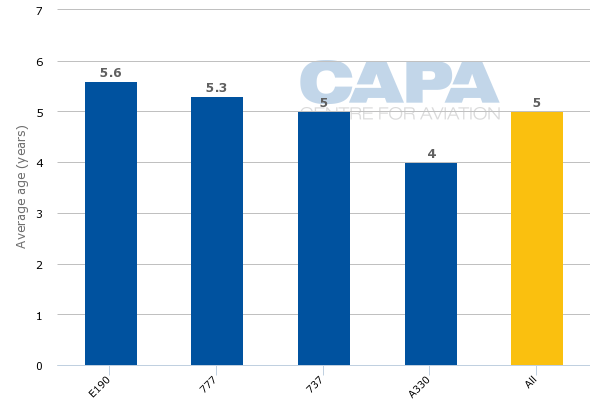 Virgin's 737s average five years of age, but this is slit between very new aircraft and some older than 10 years. Approximately 70% of Virgin's fleet (excluding Virgin Regional) is comprised of 737s. Over 95% of Virgin's fleet is leased. The Virgin Australia group fleet has grown 72% from 87 aircraft in 2010 to 150 in 2014. Growth has been largest in the regional sector; mainline fleet has grown by a smaller – but still fast – 34%. Virgin had previously mooted international expansion with A330s, and Mr Borghetti stated the A330s will eventually be used internationally. However, a timeframe and destinations were not specified. The prospect remains uncertain with no destinations immediately clear. Virgin would hope to serve Singapore and tap into the feed of partner Singapore Airlines, but SIA wants to exclusively serve main Australian destinations. Virgin could not serve an Asian point without the help of a partner (or partners). Theoretically Virgin could consider launching direct flights to key Asian cities SIA links with Australia, offering a non-stop proposition instead of one-stop through Singapore. However, this market is too fragmented. SIA's largest connecting markets are Delhi to Melbourne and Sydney, but these each see about 60-70 passengers a day and are concentrated in leisure, according to OAG Traffic Analyser. Virgin would lack substantial premium traffic and would need to feed traffic from its Australian points, creating one-stop proposition that SIA (and others) could better serve via Asian hubs. After Delhi, Colombo, Ho Chi Minh, Hong Kong and Manila are popular SIA connecting markets but too small to sustain non-stop service, and except Hong Kong would lack premium traffic. In 2011 Virgin had planned to operate a Brisbane-Singapore-Abu Dhabi service that would complement Etihad's service on that route, jointly giving the two a daily operation. But in 2013 Etihad moved to a daily operation with its own metal and from 2015 will operate a non-stop service. Virgin's A330-200 would not be capable of serving Abu Dhabi non-stop. Etihad is facing challenges securing more Australian traffic rights, but Virgin's existing Abu Dhabi service – non-stop from Sydney – has not performed strongly, meaning a secondary point service would likely be weaker. Virgin has two other strategic partners: Air New Zealand and Delta Air Lines. Virgin is unlikely to deploy a widebody across the Tasman to New Zealand while the A330-200 would lack range to reach North America non-stop. Qantas operated a Melbourne-Auckland-Los Angeles A330 service, but for Virgin to contemplate a New Zealand stopover would be convoluted given its separate partnerships with Air New Zealand and Delta. There are no immediately obvious international destinations for Virgin. International expansion with its own metal would be risky and returns low – as Qantas demonstrates. Further, even if international could work, it would likely be a distraction for Virgin at a time it must retain a laser focus on its core domestic market. Costs have been increasing faster than yields as Virgin improved its product and Qantas has an aggressive cost reduction programme, so Virgin Australia will have to show cost restraint. Virgin and Qantas may be slowing their unsustainable domestic capacity growth, but they will look to increase competition strategically rather than through adding seats. Both are banking on revenue improvements from the PROS revenue management system. Virgin is seeking to accelerate its loyalty programme as Qantas continues to advance its own. International flying meanwhile could bring incremental gain while risking far larger losses and management bandwidth that could be better spent on the domestic market. Mr Borghetti is likely – hopefully – affirming potential international operations to stimulate excitement. He has spoken of how no airline has hurt itself by flying too little. He will have to prove the proposition.